When you refer a family that signs up for any of our regular programs you will both benefit in many ways. FREE FULL SESSION of Saturday events! Both children will receive matching T-shirts! MEMBERSHIP: $35.00 annual membership fee per child (due at the date of enrollment; up to 3 siblings, any children thereafter are included with first three (3) children). Membership is valid for 12 months from the date of enrollment. TUITION: Due on the first class of each new session. Payments received after that will be assessed a $5.00 billing fee ($30.00 for competitive programs). Visa, MasterCard, American Express, and Discover accepted with $2.00 convenience fee. Automatic withdrawal is available, see office. $30.00 fee applied for all returned checks. All sessions are 4 weeks unless indicated; proration upon request or make ups will be allowed for 3 week sessions when applicable. Pay by Class Rate is $20 per class (60 minutes or less) and $25 for (61 minutes or more) after initial trial class has been attended. Must call at least 48 hours in advance to reserve a spot; space not guaranteed. Sorry, NO refunds. *Stand alone program (rates are set and not eligible for discounted additional class rate). DROPS & VACATIONS: A drop notice form is required 2 weeks prior to cancellation date of class to cancel enrollment and tuition charges! Drop and vacation forms are available at the office. Email notices are no longer accepted; hard copy forms are required. You will be responsible for tuition for failure to notify the office. Vacation notice must be in writing 30 days prior to date in order to receive prorated tuition for any missed classes (up to two weeks for recreational programs only, any longer we must drop you from the class; not applicable to competitive programs). DISCOUNTS: When you pay for three (3) consecutive sessions in advance you will receive a $10 discount off your total, plus three FREE Saturday Event Clinics! (NO refunds). Sibling discounts: $5.00 off 2nd child in program, $10.00 off 3rd, $15.00 off 4th, etc. MAKE-UPS: Permitted no earlier or more than 4 weeks after missed class date and student must be currently enrolled. Please schedule at least 48 hours in advance or during a Saturday class in the child’s level. Failure to attend your scheduled make up will result in a forfeit of the make up/missed class. Missed date is required at time of scheduling. July 1-7 (Independence Break); September 3 (Labor Day); November 18-24 (Thanksgiving Break); December 23-31 and Jan. 1st. (Winter Break). Sessions will have 4 weeks of class; when holidays interrupt sessions, members will be offered a make-up. EVENTS: FREE if you pay for the upcoming session prior to the Monday it is due. Please see session calendar for more specific dates and times. $15.00 per clinic unless indicated; members & non-members are welcome; please sign up at least 48 hours in advance, subject to cancellation; account will be credited if cancelled. GOT GOOD GRADES? Ask us about our Good Grades reward system! WHAT TO WEAR TO CLASS: Athlete attire should be close-fitting, movement-friendly, and hardware-free. No bare midriffs. No two pieces. No jeans. Wear bare feet. Hair secured up and out the way. No dangly jewelry, necklaces or bracelets. Silks: Leggings and a leotard, tee shirt over is optional. 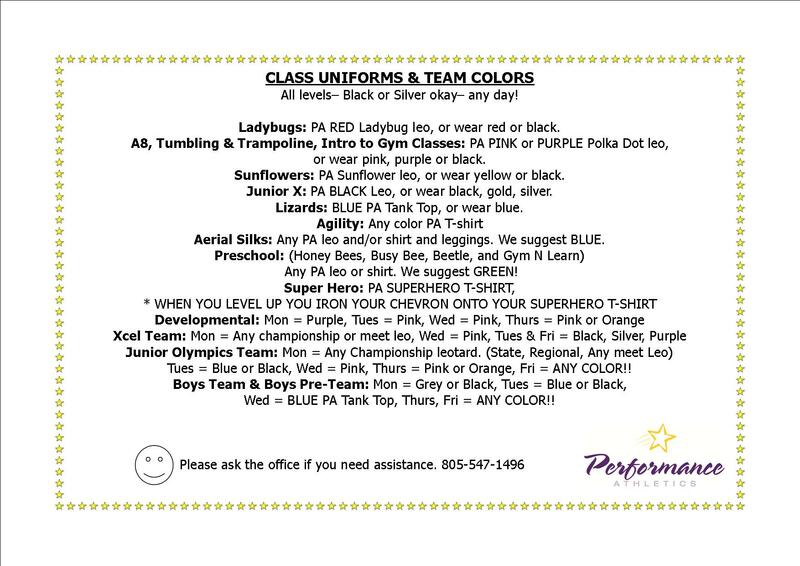 Ask us about class uniforms! Click here for UNIFORMS BY CLASS.